As the temperatures turn cooler here in Kansas City, people are going to be spending more time inside. And so, we will also turn our attention inside. Today we’re talking about car interiors. And why wouldn’t we? Upholstery, dashboards, and steering wheels help define a car just as much as bumpers and taillights. And most people spend a lot more time looking at their cars from the inside out. So I’ve gone through my photo collection to find a good sample of interiors for your viewing pleasure. Let’s take a look at some notable examples. Of course, in the early days, most car interiors didn’t focus on comfort and amenities like they do now. They evolved from stagecoaches and buggies, which obviously didn’t have things like gearshifts, gauges, and steering wheels. They just had the basics; whatever was needed to accelerate, steer, and stop. In some cases, that meant a stick tiller instead of a steering wheel. There were even some cars in which the driver sat in the back seat! The standardized layout that we’ve all come to know and love took some time to perfect. By the 1930s, the new had worn off the concept of the automobile, and people expected a little style in their rides. Even the most generic Ford Model A had attractive, well-finished gauges and a convenient layout. Higher-end cars took that to the next level, with lavish ornamentation and attention to detail. Take the Cord 812 in this picture. All that rich leather and machine-turned chrome is simply dazzling. This was definitely designed for people that cared about their driving environments. Things settled down a bit in the 1940s. Quality was still important, but a second world war in two decades seemed to mute some of the flashiness. This was a decade of wool broadcloth upholstery, dark brown and grey tones, and simple, Art Deco embellishments. Take a look at this ’42 Hudson. Yes, it has the big crest on the steering wheel and the cool font in the speedometer. But somehow, it still comes across as conservative. Sure, you could buy a Cadillac and still get a good bit of pot metal chrome, but that was more the exception than the rule. Things changed immensely by the mid-to-late-1950s, however. Cadillacs had so much chrome you could go blind on a sunny day, and Chevrolet went out of their way to make their cars look like Cadillacs. The color palette was unlimited. What do you like—pink, yellow, bright red, or turquoise? Maybe a combination of all of them. Some fords had Lucite windows to let the sun shine through on the gauges. Buicks had mirrors that reflected the backwards speedometer back at the driver. Chrysler products featured square steering wheels and push button transmissions. The only limit on styling, it seemed, was the imagination of the designers. All that razzle-dazzle did come at a price, though. It wasn’t exactly safe, and a chrome bullet horn button looks considerably less-attractive when it’s sticking out of somebody’s neck. Combine that with a more cynical, conservative attitude, and you can see why car interiors looked so much different by the mid-to-late 1960s. The chrome was more under control. Colors skewed more toward black or saddle--maybe a little houndstooth thrown in for good measure. Hard metal surfaces gave way to more forgiving plastics. And steering wheels became uglier, softer, and safer. And speaking of softer, how about them 1970s. This ’74 Cadillac Talisman is an extreme example of the decade, with acres of pleated velour and enough ultra-plushness to lose a small child in one of the seams. Look at some of the cars during this time—the Ford Elite, the Chevy Monte Carlo, the Chrysler Cordoba. People were looking for the maximum amount of personal indulgence whether it made sense or not. Meanwhile, the government was legislating heavy safety devices like extra door beams and shock-resistant bumpers. You started seeing some early airbag technology during this time. Like the ‘50s, the ‘80s was another colorful, optimistic decade. Think Max Headroom and Miami Vice. When Knight Rider came out in 1982, they probably didn’t know how close to reality they actually were. Digital, colorized graphic gauges? Look at the instrument panel of an ’84 Corvette. Informational TV screens? You can hardly buy a car today without one. Voice activation? GPS technology? Hands-free telephones? That stuff isn’t science fiction anymore. It would take another decade before all of that really took root, however. Fuel mileage, powertrains, and overall quality made huge strides in the 1990s, but bright colors and technology seemed to take a, um, back seat. You saw a lot more leather and soft-touch materials. But there were fewer colors to choose from, and even all that leather looked and felt more like thin, cheap plastic. Passive restraints were mandated; airbags preferred. 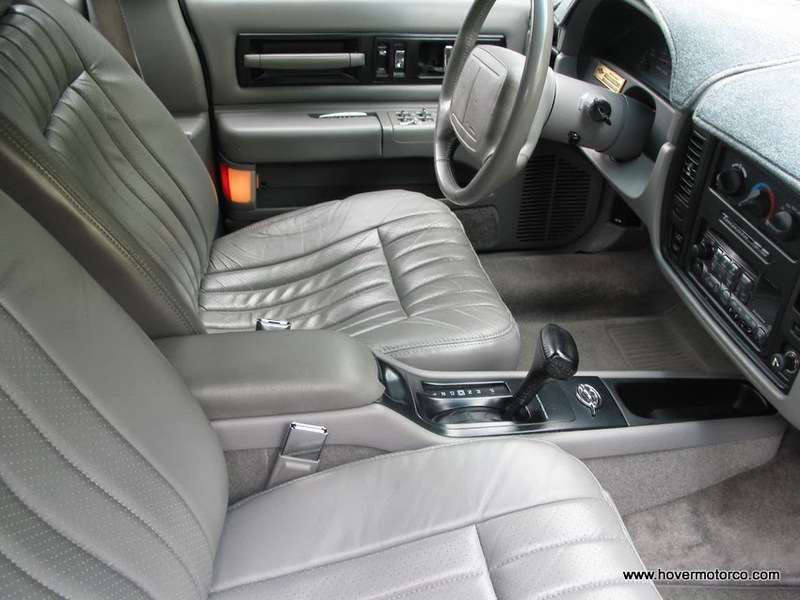 That’s why as a whole, the 1990s have some of the most hideous steering wheels ever designed. This was my old 1996 Impala SS, by the way. It was considered sporty at the time. But look at us now. The auto industry is as competitive as ever, and customer expectations are higher than ever. People want it all: quality, technology, and safety. Things have to look nice, feel nice, and work nice. You might not think you’re into modern cars, but take some time to really look at what is going on with today’s interiors. The stitching, materials, and ergonomics are as nice as they have ever been in history. The gadgets and functions most cars have are nothing short of amazing. It hurts my brain to even think that there are people smart enough to come up with this stuff. And yet, here we are. Is the Tesla Model S in this photo more of a car or a computer? The slideshow below has more than 750 pictures of car interiors that I personally photographed in the past few years. They range everywhere from vintage to modern, sporty to luxurious. I actually think it’s a fun group of pictures to go through. I hope you do too. Click this link for a better version. ANOTHER great article...........All we can say is " THANKS " ! I think instead of making the cars vehicle from the inside, auto companies should stress in making them more comfortable for ride.